Russian sage scientifically known as Perovskia atriplicifolia is a deciduous woody shrub in the mint family (Lamiaceae). The plant is native to central Asian countries such as Afghanistan, Pakistan, and Tibet and grown as a landscaping plant in U.S. Department of Agriculture plant hardiness zones. Although the aromatic shrub is called “sage,” it is not a culinary herb. In fact, the plant contains a chemical that can be toxic in large doses. 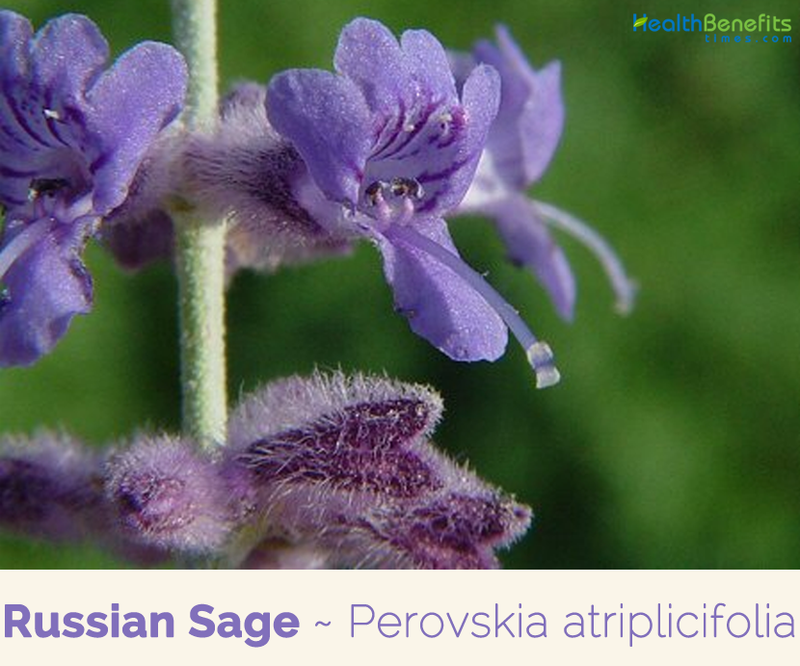 Apart from Russian Sage it is also known as Russian sage and Afghan-sage. Genus name honors Russian general V. A. Perovski (1794 – c. 1857). Specific epithet means with leaves resembling salt-bush. 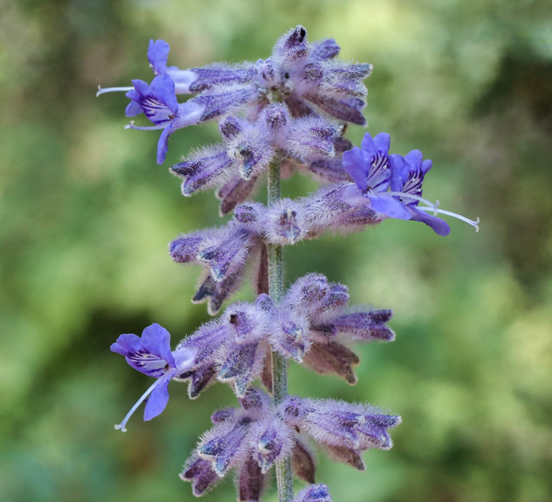 The intense fragrance of Russian sage is similar to some of the true sages. It was a relatively unknown landscaping plant until the 1990s, despite being mentioned by well-known landscape authors such as Gertrude Jekyll and Russell Page. Its fragrant flowers attract bees and butterflies. It is used in herbal medicine to soothe the stomach, treat fevers and help relieve cold or flu symptoms. Talk with your doctor before using Russian sage for medicinal reasons. Russian sage is a deciduous, semi hardy, flowering herbaceous perennial plant and subshrub with an erect to spreading habit that grows about 0.5–1.2 m (1 ft. 8 in–3 ft. 11 in) tall, with occasional specimens reaching 1.5 m (4 ft. 11 in). The mature plant may be 0.6–1.2 m (2 ft. 0 in–3 ft. 11 in) across. The plant tolerates a variety of soil conditions. Young specimens perform best when planted in a mixture of peat and either sand or perlite. P. atriplicifolia can thrive in sandy, chalky, or loamy soil, or heavy clay soil with sufficient drainage. It can endure a wide range of soil pH, as well as exposure to salty conditions near oceans. Rigid stems are square in cross-section, and are covered by an indumentum formed by stellate, or star-shaped, trichomes and oil droplets. Especially during autumn, these hairs give the stems a silvery appearance. Plant has grayish-green leaves that are arranged in opposite pairs, and attached to the stems by a short petiole. They are generally 3–5 cm (1.2–2.0-inch) long and 0.8–2 cm (0.3–0.8-inch) wide, although narrower in some populations. The overall leaf shape is oblate; a rounded shape longer than it is wide, to lanceolate, shaped like the head of a lance. They are pinnatipartite, with a deeply incised leaf margin that may be either wavy or sharp-toothed; even within a single community of P. atriplicifolia, there can be considerable variation in the details of leaf shape. Leaves near the top of branches may merge into bracts. The foliage is aromatic, especially when crushed, with a fragrance described as sage-like, a blend of sage and lavender, or like turpentine. The inflorescence is a showy panicle, 30–38 cm long (12–15 in), with many branches. Each of these branches is a raceme, with the individual flowers arranged in pairs called verticillasters. Each flower’s calyx is purple, densely covered in white or purple hairs, and about 4 mm long (0.16-inch). The corolla is tube-shaped, formed from a four-lobed upper lip and a slightly shorter lower lip. The blue or violet blue petals are about 1 cm long. The style has been reported in both an exerted—extending beyond the flower’s tube—form and one contained within the flower. Flowering normally takes place from September to October. Fruits develop about a month after flowering, and consist of dark brown oval nutlets, about 2 mm × 1 mm (2⁄25 by 1⁄25 inch). Russian Sage steeped for 15 to 30 minutes in a covered cup of hot water makes a medicinal tea that can be used to help relieve stomach upset and indigestion. Russian sage is said to arrest diarrhea and soothe the stomach. You can drink the tea cold or hot. Russian sage is used to help reduce fevers. The steeped tea is left to cool. A cloth is soaked in the tea and used as a compress on the forehead to help reduce the fever. Aromatic scent of the sage also helps by having a soothing effect. Russian sage is aromatic; it helps open blocked airways and has a calming effect. This is one of the reasons it is used to help relieve cold and flu symptoms. It has expectorated properties that ease bronchial afflictions. Pot of boiled water filled with Russian sage leaves can be used similar to a steam pot. Place a towel over your head and lean over the pot Russian sage infused water. Sage steam will help clear blocked nasal passageways. As with any hot tea, Russian sage tea when drunk warm, helps the body to perspire. Calming tea can help sooth nausea associated with colds and flues. The plant is used as a cooling medicine in the treatment of fevers. In Balochistan, Pakistan, a decoction of the plant’s leaves and flowers has been considered an anti-diabetic medication and a treatment for dysentery. It is also used where it grows in Pakistan and Balochistan for dysentery. Russian sage is a useful medicinal herb for soothing an upset stomach, treating a cold or flu, or washing a wound. Russian sage is stimulating and aromatic, and its volatile oils are useful for clearing sinuses or soothing a head cold with an inhalation steam. Russian sage blends well in a tea with elderflower, spotted bee balm, wild bergamot, and yarrow. Russian sage tea or tincture can help relieve a sinus or barometric-pressure headache and dispel gas and bloating that may follow overindulgence or a heavy meal. Its aromatics are also useful for soothing nervous anxiety and tension. Massage oil prepared from Russian sage helps to stimulate circulation, especially during winter to help warm the body. Small lavender flowers have a sweet flavor and can be eaten in salads or used as a garnish. P. atriplicifolia is sometimes used in Russia to flavor a vodka-based cocktail. Leaves are smoked like tobacco for its euphoriant properties. This species is suitable for forming an internal decorative hedge of moderate height. Russian sage works well for perennial borders, mixed borders, wildlife gardens and other landscape areas. Grey-green leaves yield a distinctive odor when crushed. They can also be crushed to yield a blue colorant that can be employed in cosmetics or as a textile dye. It should not be used in cooking or eaten in any matter because of its poisonous leaves. The effect on each person can vary greatly depending on your body’s individual reaction, but generally it is not considered toxic. Handling the plant has been known to cause skin irritation or an allergic reaction in some individuals. You should always wear gloves when working with Russian sage. Flower Each flower’s calyx is purple, densely covered in white or purple hairs, and about 4 mm long (0.16-inch). The corolla is tube-shaped, formed from a four-lobed upper lip and a slightly shorter lower lip.